Kwara state Police command in a press statement issued by the command PRO, DSP Okasanmi Ajayi have it that the kwara state police have apprehend six confirmed cultists. Kwara state Police Command in line with the directive of the Inspector General of Police, on zero tolerance for crime and criminality anywhere in the country, which is evident in the arrests and prosecutions of different categories of criminals both in Kwara and all over the country, has further spur the Command to action in making sure that criminal elements are not allowed to hibernate in the state. The Command is also reiterating its absolute confidence in the ability of the Inspector General of Police Ibrahim Kpotum Idris, NPM mni, to rid the nation of crime and criminality, to achieve this, the support and cooperation of all and sundry is very essential. 1.Abolaji Safti Ojulari of Kankatu area, Ilorin. 2. Lanre Mohammed Soliu aka Askari of Ile Nda Compound, Ilorin. 3. Azeez Moyaki of Moyaki Compound, Gambari area Ilorin. 4. Suleiman Babatunde of Gambari Area, Ilorin. 5. Yusuf Habeeb of Kangile Village, Kulende, Ilorin. 6. Umar Yahaya of Kangile Village, Kulende, Ilorin. 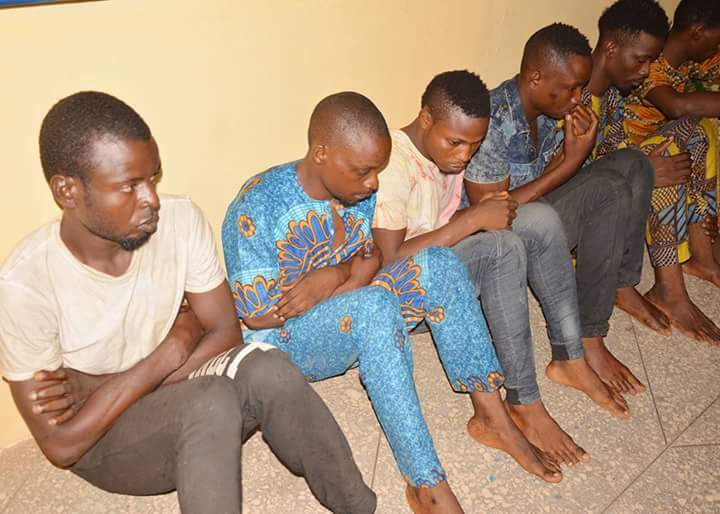 The above suspects confessed to the killings of eleven (11) people with their accomplices within Ilorin and it's environs between 2016 and April 2018. Criminal elements in the state are advised in their own interest to eschew criminal acts as the Command in its renewed vigour is super now than ever to run them out of circulation. Finally, the Kwara State Command shall continue to do its bit in maintaining ĺaw and order within the ambit of rule of law, and respect to rights of every citizens as constantly being emphasized by the Inspector General of Police, please.